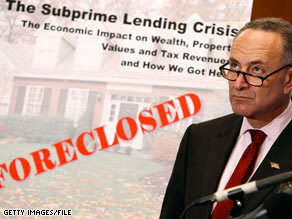 Schumer: IndyMac "one of the most poorly run and reckless of all the banks"
NEW YORK (CNN) -- Sen. Charles Schumer said Sunday the Bush administration is trying to "blame the fire on the person who calls 911" by suggesting he had a role in one of the costliest U.S. bank failures. Sen. Charles Schumer said the OTS "ought to stop pointing false fingers of blame." Federal regulators with the Office of Thrift Supervision were "asleep at the switch" when it came to IndyMac's "reckless" behavior, the New York Democrat complained. The OTS announced Friday that it was taking over the $32 billion IndyMac and transferring control to the Federal Deposit Insurance Corporation. "In the following 11 business days, depositors withdrew more than $1.3 billion from their accounts," the OTS said in a statement announcing the California-based lender's takeover on Friday. The statement included a quote from OTS Director John Reich saying, "Although this institution was already in distress, I am troubled by any interference in the regulatory process." "OTS ought to stop pointing false fingers of blame and start doing its job to protect the future of the banking system, so that there won't be other IndyMacs," he said. Schumer's June 26 letter said he was "concerned that IndyMac's financial deterioration poses significant risks to both taxpayers and borrowers." In a Sunday news conference, he said everything in his letter was already known to the public. "IndyMac was one of the most poorly run and reckless of all the banks," he said. "It was a spinoff from the old Countrywide, and like Countrywide, it did all kinds of profligate activities that it never should have. Both IndyMac and Countrywide helped cause the housing crisis we're now in." The embattled Countrywide Financial Corp. was recently purchased by Bank of America. Schumer argued that the "breadth and depth" of the problems at IndyMac were "apparent for years, and they accelerated in the last six months." But OTS, he said, "was asleep at the switch and allowed things to happen without restraint. "And now they are doing what the Bush administration always does: Blame the fire on the person who calls 911." Schumer said OTS is "known as a weak regulator," and added, "my job was to try and toughen them up and that's what I tried to do." IndyMac, with assets of $32 billion and deposits of $19 billion, is the fifth bank to fail this year. Between 2005 and 2007, only three banks failed. And in the past 15 years, the FDIC has taken over 127 banks with combined assets of $22 billion, according to FDIC records. IndyMac will reopen Monday with a new charter and a new name -- IndyMac Federal Bank.